To visit Hawaii, is to love Hawaii and boy, is there a lot to love. 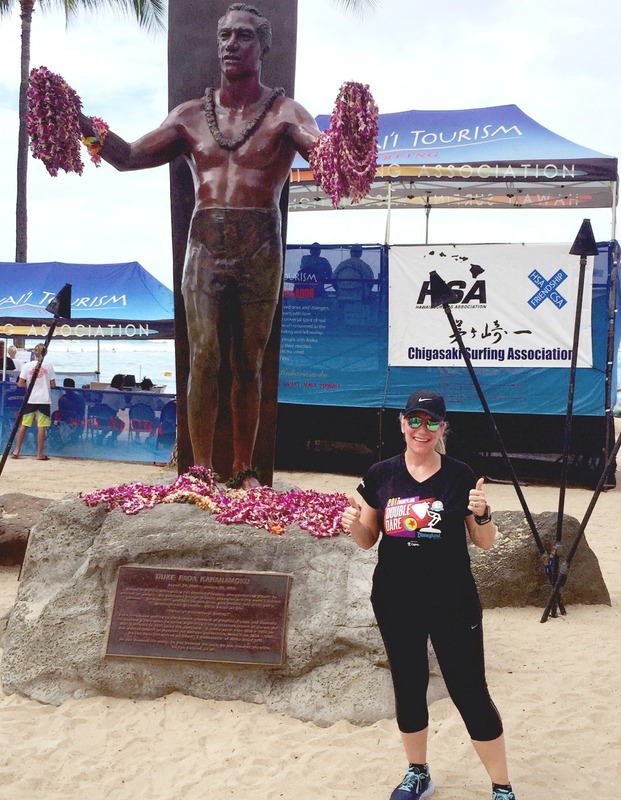 The weather, the food, the beaches, the people and the spirit of aloha. It’s the ultimate feel good holiday destination. 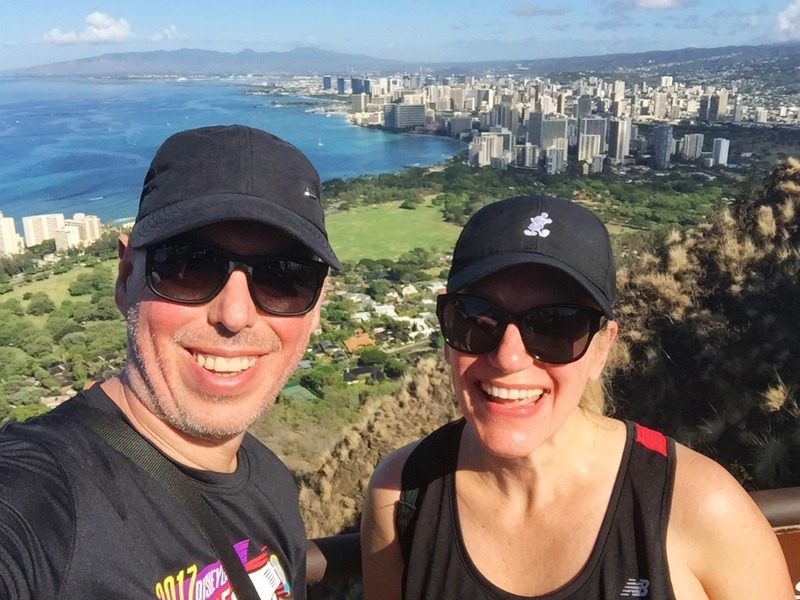 We first went to Waikiki on honeymoon in 2007 and in recent years have rekindled our love affair with the place. The fact is there is so much to see and do, that you rarely have to do the same thing twice although we have so many favourites, it’s good to go back. It’s no secret that eating is one of our favourite things about travelling so I’ve tried to break my list down into edible experiences and ones that involve no eating at all. 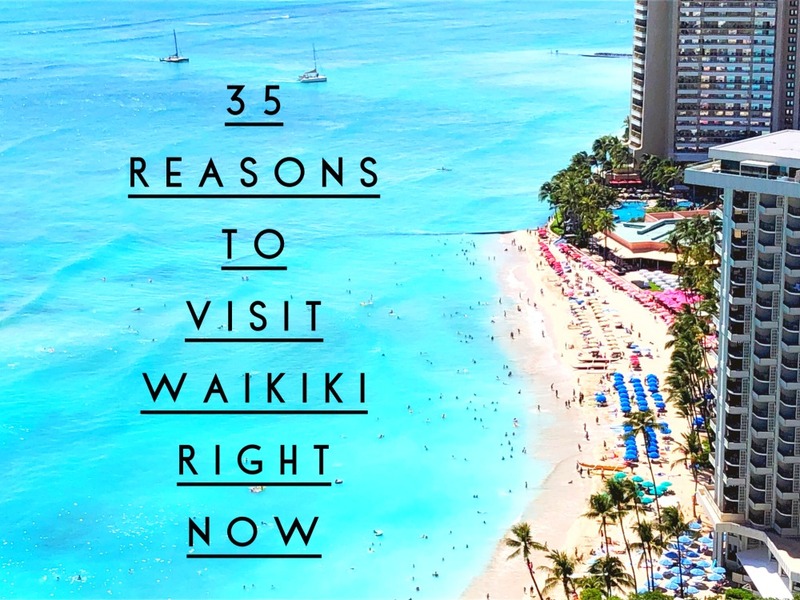 Whatever way you look at it, there’s no such thing as too many visits to Waikiki and here are 35 reasons why. Leonard’s Bakery is an island institution and has been delighting both locals and visitors with their super delicious malasadas since 1952. These Portugese doughnuts are best enjoyed warm – they’re kind of like the doughnuts you get from a hot doughnut van, only they’re way lighter, way fluffier and way more delicious. There’s too many different varieties of malasadas to choose, so save yourself the bother and get a selection so you can try one of each! If you can’t get to the bakery on Kapahulu Avenue, look out for one of the malasadamobiles (yes, that’s totally a thing!) 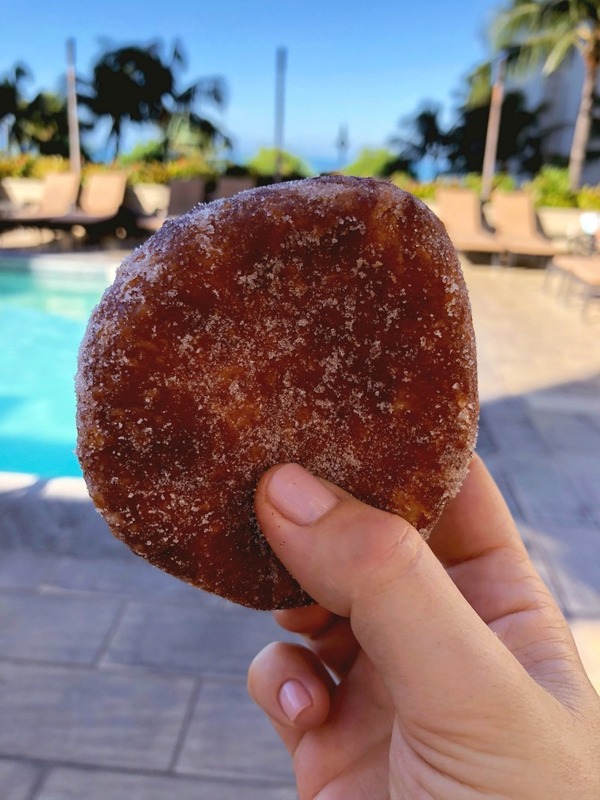 because everyone should get their mits on their malasadas! This is celebrity chef Bill Grainger’s Hawaiian outpost and a very jolly nice spot it is too! Here you’ll find all Bill’s classics that we all know and love including corn fritters, ricotta hotcakes, plus some delicious locally influenced/fusion dishes. This is one of our favourite spots for brekkie or brunch and the coffee is mighty fine too. Walk ins are welcome but you can also make reservations. 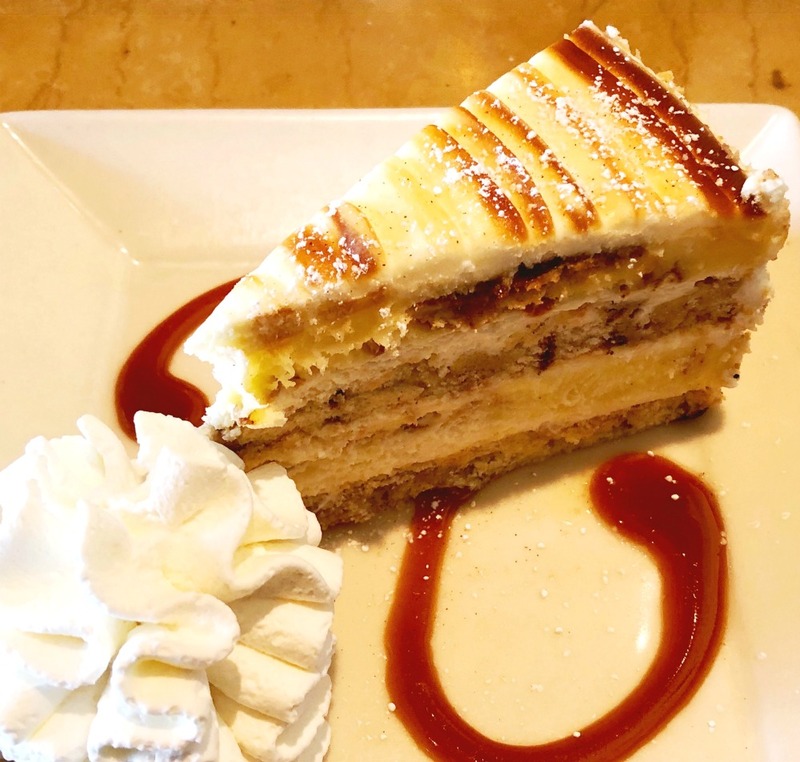 I know Cheesecake Factories are ten a penny in the US but this was the first Cheesecake Factory I ever visited so it will always have a special place in my heart. Here you’ll find a relaxed vibe, a vast menu, enormo-portions, reasonable prices and the most delicious cheesecake! One thing is for sure, you won’t be leaving hungry or disappointed. This place is always popular so be prepared to wait in line and try to score an outside table, it’s the perfect spot for a bit of people watching. 4. Okay, try some Poke! Poke (pronounced po-keh) is basically raw fish with sauces and seasoning and what started off as a snack for fishermen has become one of the most popular dishes in Hawaiian cuisine today. 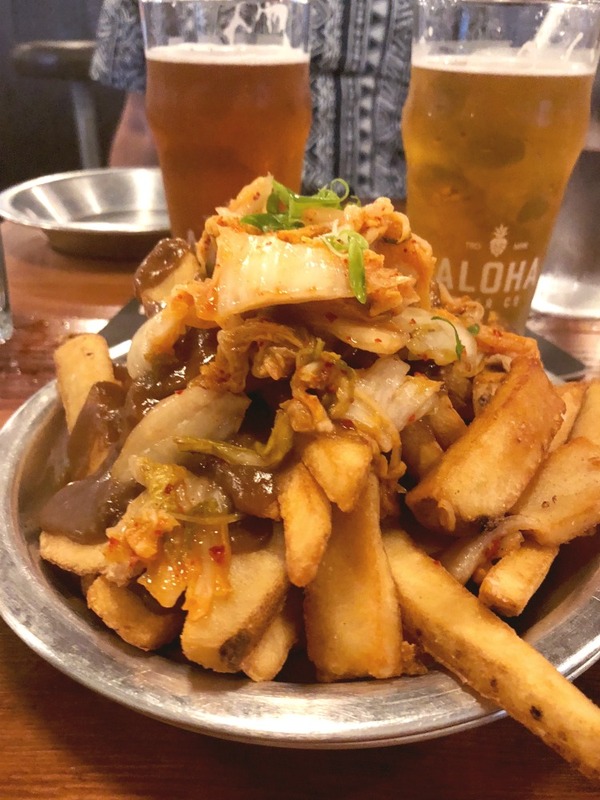 There are a plethora of places to get your poke in Waikiki and here I’m going to defer to Sher who has totally taken one for the team and found the best places for poke in Honolulu. 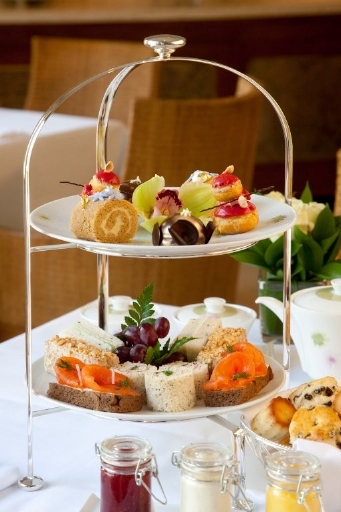 You’ll be hard pressed to find a more beautiful spot to enjoy a traditional afternoon tea than the Halekulani Hotel. Not only do you have a choice of tea, you have a choice of settings; take your tea at Orchids, the restaurant overlooking the sea or on the Verandah, the hotel’s open air lounge next to the hotel’s exquisitely manicured lawn. Afternoon tea includes sandwiches, scones and savouries but you can upgrade with a glass of bubbles and fresh strawberries and cream. Go on! You know you’re worth it! This chic 24 hour diner located in the HiltonHilton Waikiki Prince Kuhio Hotel offers breakfast, lunch, dinner and everything in between but it also offers the Mac Daddy Challenge – can you eat five pounds of pancakes in 90 minutes? (We couldn’t and failed with flying colours!) If food challenges aren’t your thing, you’ll find lots of other delicious options on the regular menu. Every hour is a happy hour in Waikiki but take advantage of one of the many happy hours at bars, hotels and restaurants and you can enjoy quality food and drink that won’t break the bank. Here are some of our favourite Waikiki happy hours. With so many venues and so much choice, if you time it right, you can enjoy happy hour all afternoon from 2pm until 6pm and if you’re still hungry for more, you can go back for seconds, at one of the late night happy hours! Loco Moco is a contemporary Hawaiian dish that has many variations but the traditional version consists of white rice topped with a hamburger patty, a fried egg and brown gravy. It’s one of those meals that can be served for breakfast, lunch or dinner and you can find my favourite version at Heavenly Island Lifestyle. 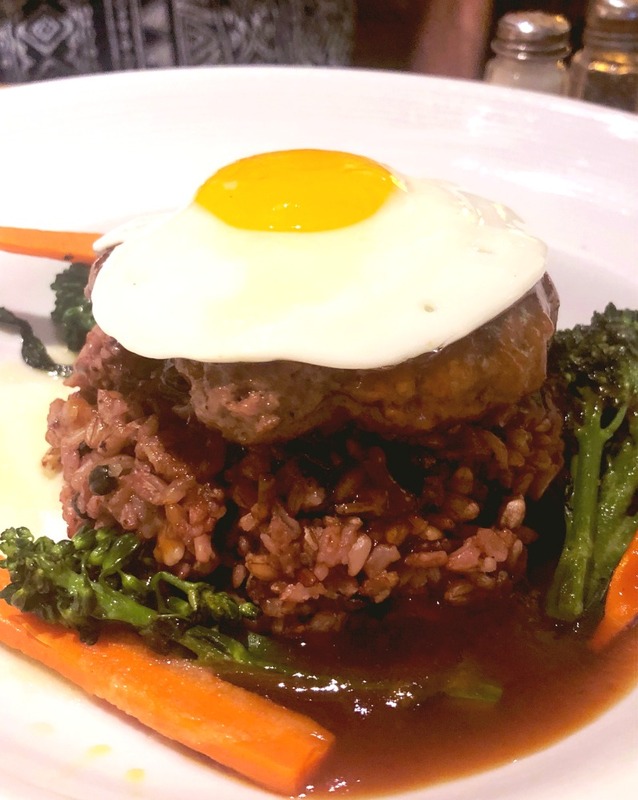 Their Big Island 100% Kulana beef patty, local eggs, local ginger soy glaze, 10 grain rice with local farm fresh veggies and organic black beans is an absolutely delicious and healthy take on a traditional favourite. If you’re happy to cast your net further afield and are heading up to the north shore, do not miss a visit to Giovanni’s Shrimp Truck. You can’t miss the graffiti covered truck with the long line. Stop by and grab yourself some scampi to go; the shrimp is marinated in olive oil, fresh chopped garlic and lemon butter and is sauteed in a pan. It’s the business! Head to this outdoor gathering spot for cool vibes and live Hawaiian music and hula dancing every night from 5.30-8.30pm. There’s a $5 cover charge if you’re not eating at the restaurant but there’s table service and free chips which kind of balances things out. The entertainment and the sunset are a winning combination – this place is just magic. Shave ice is as it’s name suggests a frozen dessert that’s made by shaving a block of ice. You can actually get shave ice all over Waikiki but my favourite is at Matsumoto’s Shaved Ice in Haleiwa Town on the North Shore where there are over 40 flavours to try! Just remember it’s shave not shaved! Take a step back in time at the La Mariana Sailing Club. 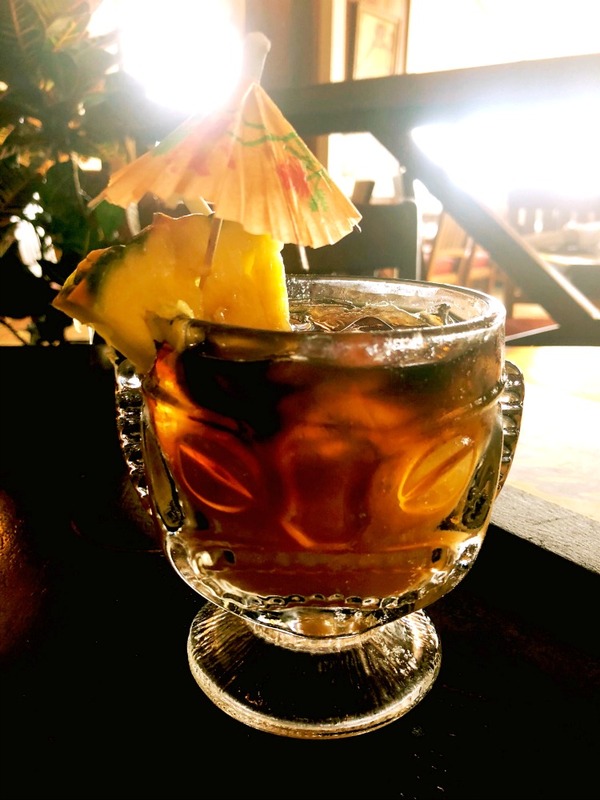 This Marina-based legend has featured on the Hawaii-Five-O TV show and is all about the retro-tiki decor and a tasty Hawaiian menu. Far from the tourist crowds, it’s a bit tricky to find but totally worth it. 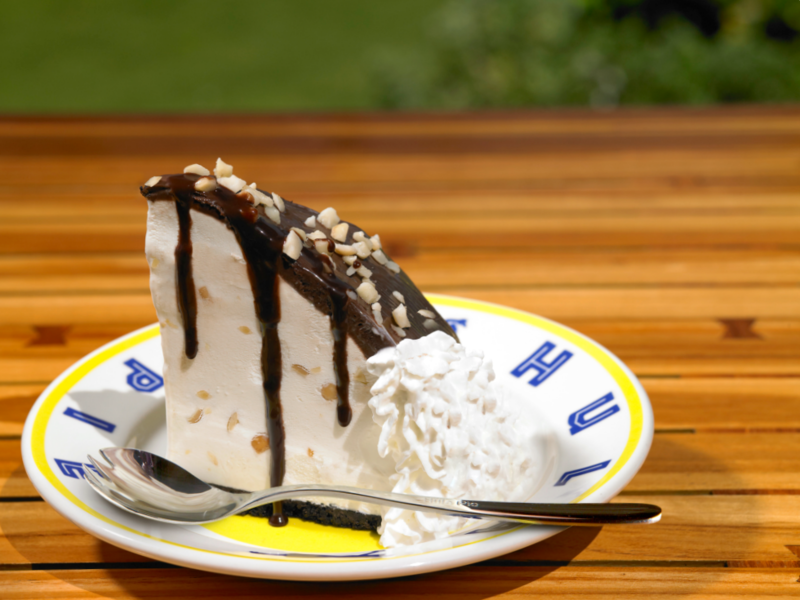 Duke’s famous Hula Pie was actually developed at Kimo’s, it’s sister restaurant, long, long ago and has been pleasing sweet-toothed dessert lovers ever since. The pie is made with macadamia nut ice cream piled high on a chocolate cookie crust and topped with chocolate fudge, whipped cream, and more macadamia nuts. Serves are generous, made for sharing and all part of the Duke’s experience! See’s Candies is an American candy chain specialising in a variety of extremely delicious chocolates and there’s a store in the Ala Moana Centre. Visiting a See’s store is such a treat not just because you can drool over the chocolate creations but because they give free samples too! I am happy to report that See’s candies and chocolates travel very well should you want to take some home. It’s the most delicious souvenir ever! Have you ever had a Dole Whip? If not, you totally need to! This pineapple flavoured soft serve dairy free dessert takes frozen treats to the next level. They are crazy good! If you can’t make it out to Dole Plantation (billed as Hawaii’s Complete Pineapple Experience) or Disneyland, don’t worry, you can get your Dole Whip fix right here in Waikiki at the Aloha Coffee Kiosk. It’s OK, you can thank me later! There is an amazing craft beer scene in Honolulu. Head away from Waikiki and check out the beer and cheer at Honolulu Beerworks, Aloha Beer Co, Waikiki Brewing Company and The Brewseum. You can find great food and drink at each brew stop and some amazing street art on the walk between them. Everyone has their own opinion on where to find the best Mai Tai in Waikiki. Personally I’m rather partial to the Mai Tais served at the Swim Bar in the Hyatt Regency Waikiki. Serial visitors to Waikiki tell me that the best Mai Tai can be found at the Hula Grill (they certainly win the prize for best glasses) but if you want to go all out and choose from a Mai Tai dedicated menu, then you need to head to the Mai Tai Bar at the Royal Hawaiian Hotel. This is my favourite place to stay slap bang in the heart of Waikiki, this resort has everything you want, and more! The spirit of aloha is strong here; the rooms are spacious, modern and they all have their own lanai, the pool is small but perfectly formed and the staff are absolutely fabulous. The Regency Club offers a delicious continental breakfast, snacks throughout the day (hello, homemade cookies!) evening hors d’oeuvres, cocktails and cordials (like a happy hour) and in the unlikely event that anyone is still hungry, there’s dessert! There is a small charge for alcoholic drinks but they’re very cheap at the price. The jewel in the crown of the Regency Club (apart from the eats and treats) is the outside terrace overlooking Waikiki beach complete with fire pit! Diamond Head is one of Hawaii’s most recognised icons and one of Oahu’s most visited destinations. The panoramic views at the top are totally amazing, it’s not every day you get to walk up the side of an extinct volcano! If you want to beat the heat, the best time to hike is early morning or late afternoon. However, if avoiding the crowds is more your jam, the best time to hike is between 1 and 4 in the afternoon. Another standout experience, is Pearl Harbor. A visit here is educational, sobering and not to be missed. 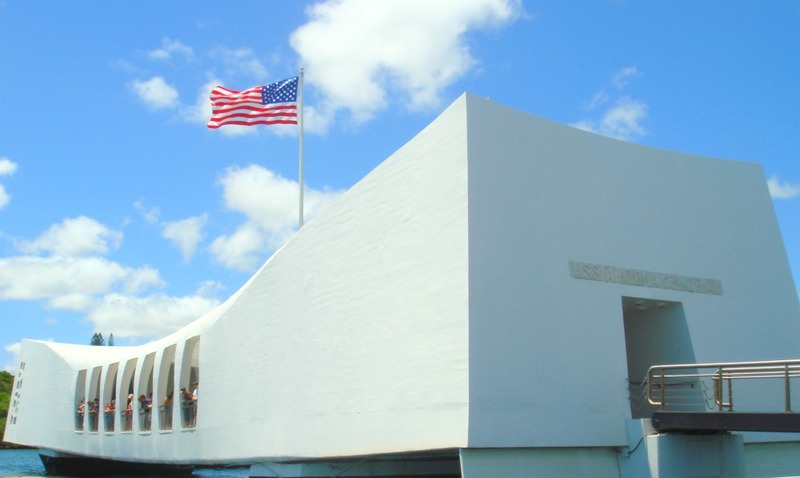 With the USS Arizona Memorial, USS Bowfin Submarine Museum, the Battleship Missouri Memorial and the Pacific Aviation Museum, there is just so much to see at Pearl Harbor plan to spend a whole day here to make the most of your visit. Now there are outlets far out from Waikiki but we never make it past Ala Moana. With over 340 shops and over 90 dining options this is the world’s largest outdoor shopping mall and with it’s spacious, modern design, it makes shopping a breeze. And when you get bored of shopping, enjoy the show – there’s live hula dancing and live Hawaiian music daily. If you’re hungry for more, pop around the corner to TK Maxx and Nordstrom Rack for more brilliant bargains. This tranquil oasis with it’s amazing views of the beach and the ocean is the perfect spot for some spa action with a view. The spa features sixteen separate session rooms, a dry sauna and an outstanding selection of signature treatments. 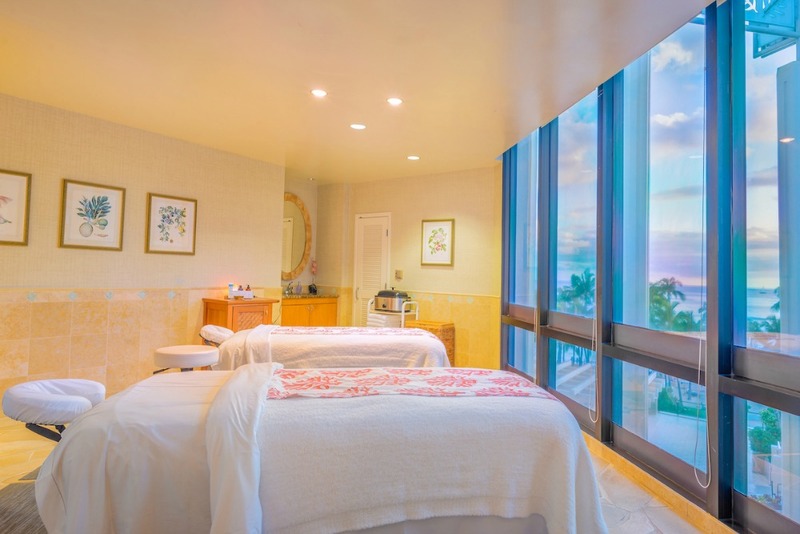 The spa prides itself on promoting wellness through the practice of Hawaiian culture, values, and arts. Whether you’re flying solo or enjoying a couples treatment, you’ll leave this spa feeling relaxed, rejuvenated and refreshed. 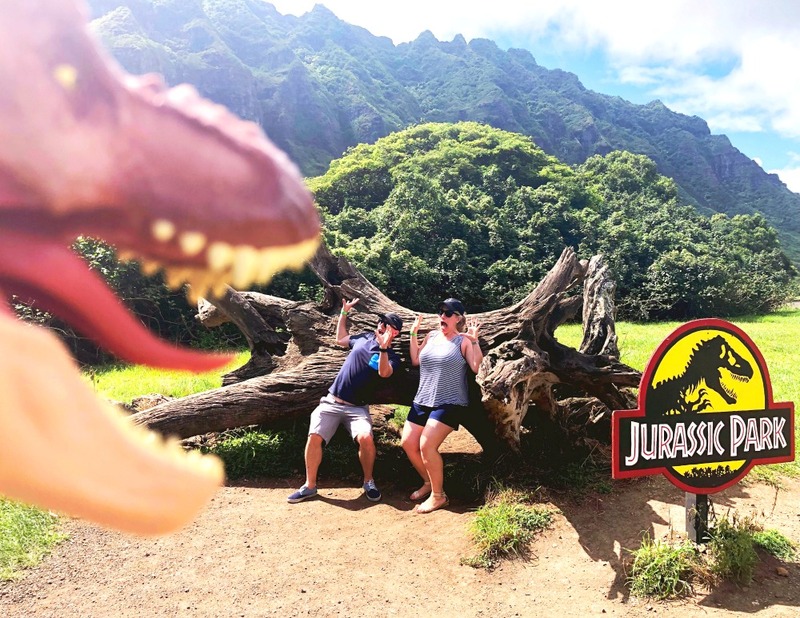 This 4000 acre privately owned nature reserve has been the backdrop for some blockbuster Hollywood Movies and TV shows including Jurassic World, Kong: Skull Island, 50 First Dates and Jumanji: Welcome to the Jungle to name but a few. The tours here come with options including kayaking, mountain biking, horseriding, ziplining or travelling by boat, jeeps and ATV. However, if you’re a purist (or scaredy cat) like me, the luxury minibus will do you just fine. You can do two back to back tours on the same day but we found the Premier Movie Site Tour was all the excitement we needed! It’s so much fun! Whether you like chillaxing by the pool or being on the beach, you’ll be all set in Waikiki. With it’s clear blue water, soft sand and gentle waves, it’s no wonder Waikiki Beach is one of the most popular and most recognised beaches in the world. If you prefer pool action, you won’t be disappointed although bear in mind that hotel pools in Waikiki are relatively small compared to the size of the property. Hawaiian sunsets are so magic, Elvis even wrote a song about them. 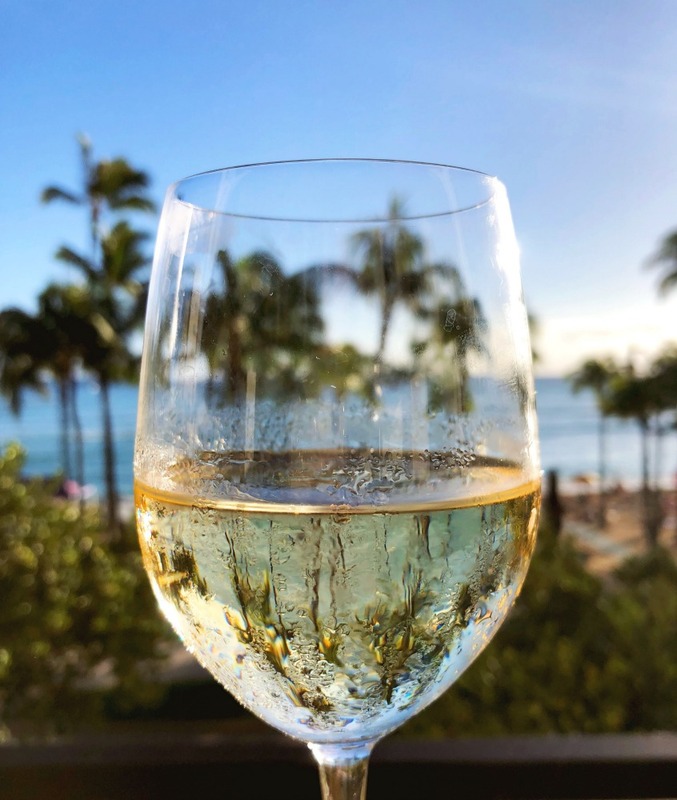 You can watch the sunset from the beach or snag a seat and grab yourself a drink at one of beachside bars – my pick is Rumfire at the Sheraton Waikiki or The Beach Bar at the Moana Surfrider. Your camera will get a thorough workout. Every Friday evening the Hilton Hawaiian Village puts on a free firework show on Waikiki Beach. The fun usually starts at 7:45pm or 8pm and lasts about ten minutes depending on the season and daylight hours. The best views are of course, from the Hilton itself but the Hilton Lagoon, Magic Island and Fort Derussy also offer great views. 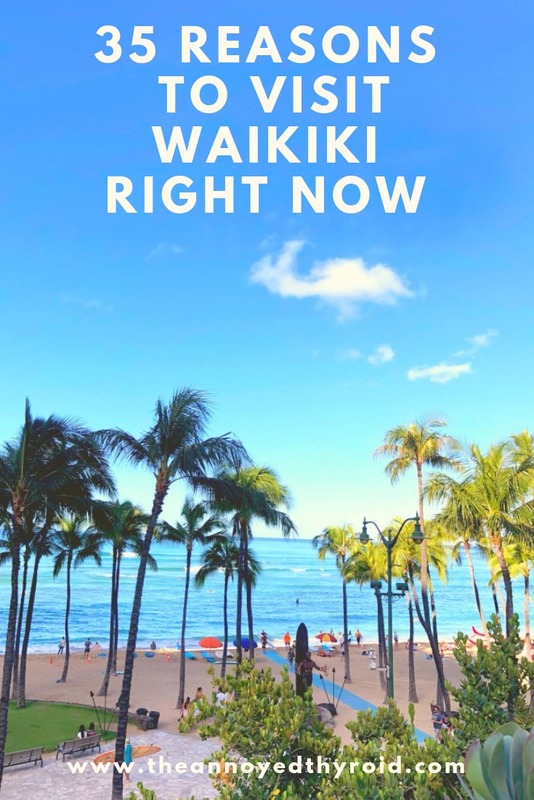 If you’re positioned anywhere on Waikiki Beach west of the Sheraton, you’ll see some of the action and if you’re on a high lanai east of the Sheraton (like the 36th floor of the Hyatt Regency Waikiki,) you’ll get a good view too! A flower lei is recognised as a sign of Hawaii’s aloha spirit and is so fragrant and colourful so why not make your own? It’s such a fun activity for adults and children alike and the bonus is that you get to wear what you make! 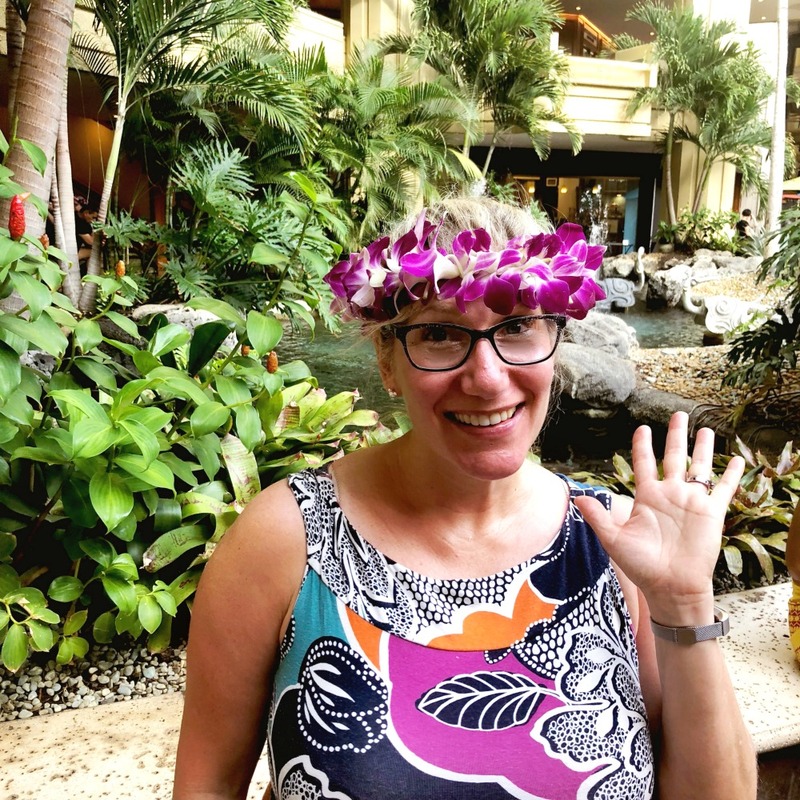 A free lei lesson was just one of a range of free cultural activites on offer at the Hyatt Regency Waikiki. 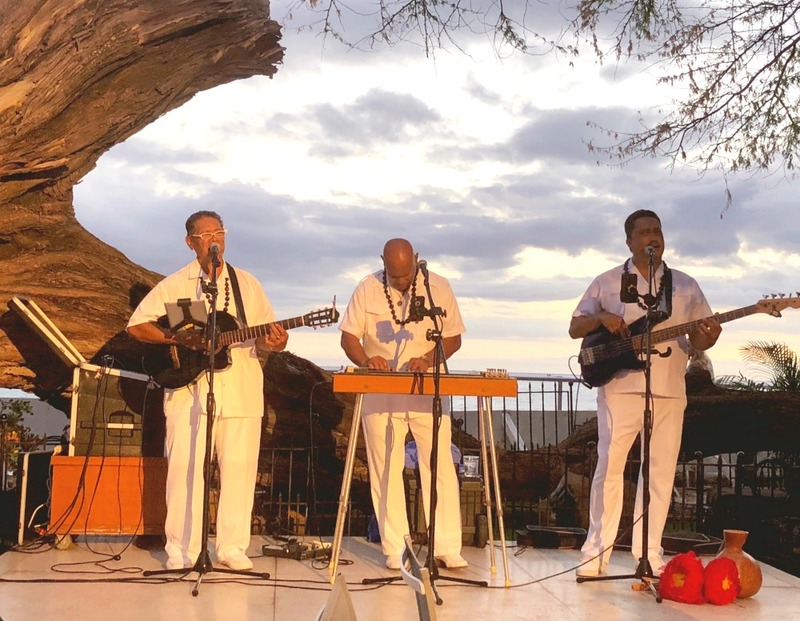 Get in touch with Hawaiian culture at a luau – a traditional Hawaiian party or feast with a side of entertainment such as Hawaiian music and hula dancing. There are a number of luaus in and around Waikiki and each is uniquely different. We loved the ‘Aha’aina at the Royal Hawaiian, which is Waikiki’s only oceanfront luau. This luau also comes with options – you can choose a package with or without a banquet. 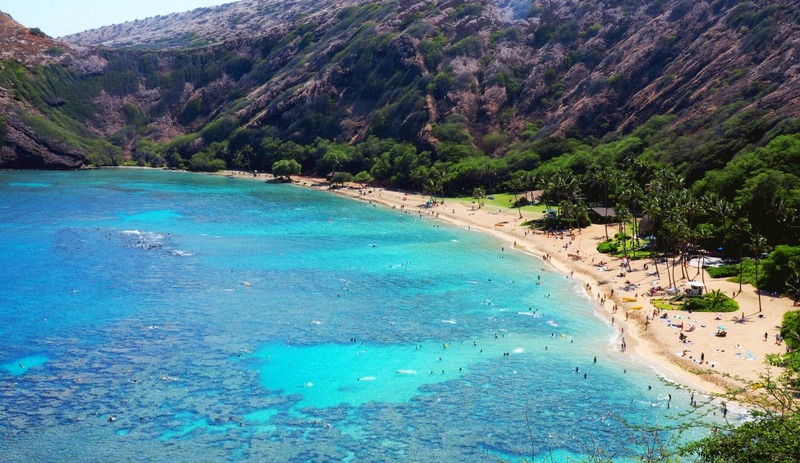 Lying at the bottom of a volcanic crater, Hanuama Bay is one of the most popular destinations on Oahu. This pristine marine ecosystem is home to over 300 species of fish making it a magnet for beginner and accomplished snorkellers alike. Parking can be really tricky here but there are regular shuttles from Waikiki for $25 and the price includes snorkel gear and a round trip with commentary. Go shopping in Haleiwa Town, check out the beach at Waimea Bay and go turtle spotting at Laniakea Beach. The North Shore has it all! Waikiki is one of the few places that you can wear matching outfits without worrying that you’re going to get arrested by the fashion police. Want to wear matching tees or Hawaiian his ‘n’ hers? Knock yourself out! 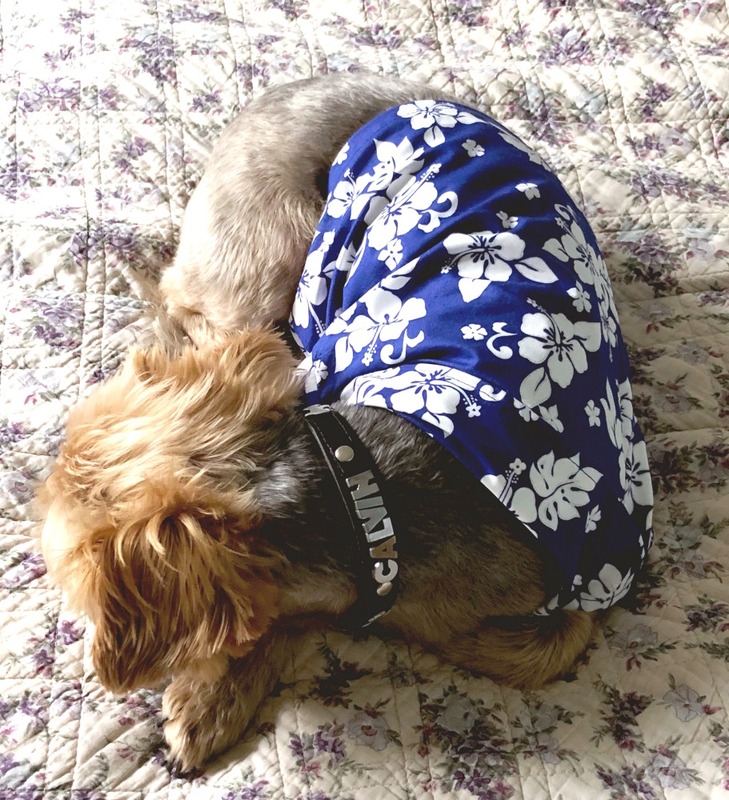 You can even buy a Hawaiian shirt for your dog! My favourite place to purchase Hawaiian themed dress ups is Duke’s Marketplace. At these farmers’ markets held every Tuesday and Thursday from 4 – 8pm, you’ll find local arts, crafts and a delicious range of local produce from fruits and vegetables to take away food and baked goods. It’s not the biggest but it is super central so you can enjoy your market delights back in your room, across the road at the beach or grab a pew in the hotel’s atrium and enjoy the waterfall. You’re going to love this family owned brewpub-museum combo. The museum, Home of the Brave is home to a speakeasy and a unique collection of WWII, Military, Beer & Hawaiiana memorabilia spread amongst over 10 different zones and is open Wednesday, Friday and Saturday from 5-8pm. 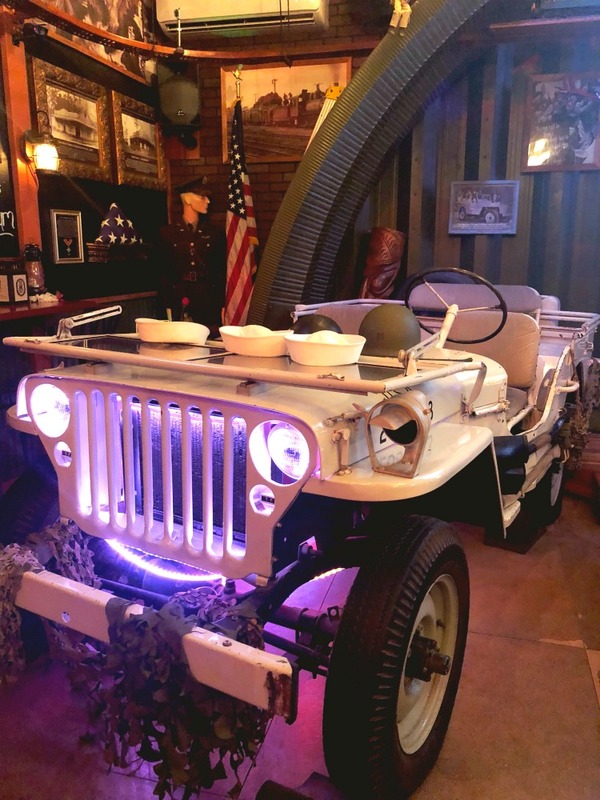 Don’t worry if you can’t make it to Home of the Brave, the Brewseum is so much more than a bar, jam packed full of World War II memorabilia complete with tiki section and in house craft brews, it’s a complete experience. There are theme nights every night (except Sunday and Monday) but try to go on a Thursday at 6pm or 7pm for a game of Battleship Bingo! It’s so much fun for the whole family and there are prizes and happy hour prices throughout the game! Have you been to Waikiki? Have you got anything to add to the list? What’s the one place you never get bored of going back to? I did not receive any financial compensation for writing this post. 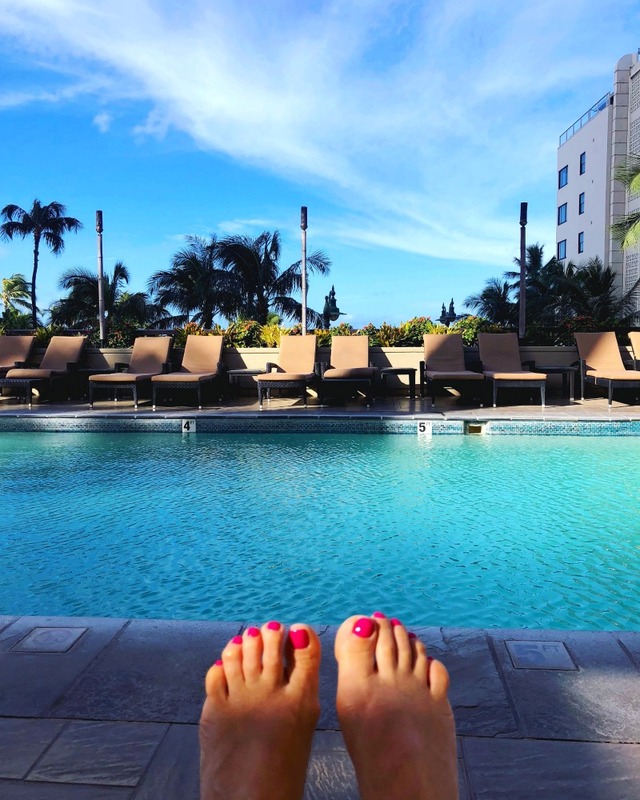 We did however receive a complimentary upgrade to the Regency Club at the Hyatt Regency Waikiki during our stay and were graciously gifted a spa treatment. As always, all opinions are honest and my own.